Figuring out how to remove alligators from the roadway is not on the agenda of most Florida tourists when they decide to take the Loop Road drive. Nevertheless, be prepared for anything on this wild, spectacular 25-mile trip through Big Cypress National Preserve deep into the Everglades. on the eastern end, Loop Road is a South Florida crushed lime rock road, in good condition and, in many places, wide enough to accommodate two cars. 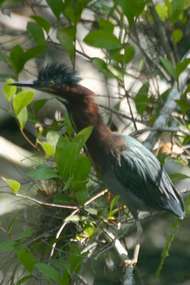 The roadway, for most of its length, is tightly bordered by canals, waterholes, trees and heavy underbrush. It's very dusty in the dryer winter and spring months and near impassible sometimes during the summer rainy season. It is easily negotiated by the family sedan throughout its length except during wetter periods. bootleggers, poachers, thieves and cutthroats. Al Capone, the notorious Chicago gangster, had a depression-era hunting lodge there, conveniently located a few miles across the Dade County line in a mostly lawless area of Monroe County. While he and others like him came for the wild life, today visitors come from all over for the wildlife. Center where you can walk the Tree Snail Hammock Nature Trail, picnic and refresh yourself. and off road - somewhere - are the remnants of Capone's old place and the notorious Gator Hook Lodge, as well as other spicy artifacts. While Pinecrest presents as a vestige of its former self - a bustling boom town replete with hunters and fishermen, poachers, gangsters, prostitutes, loggers and tough old pioneers - the area now appears to be a collection of private properties where trespassing is reportedly frowned upon. If you are interested in the history of this early settlement, looking at some old steps and broken concrete hulks, you may find someone knowledgeable here. The real draw of Loop Road is west of a center point, though, all the way to one of the most primitive and beautiful scenes in Florida at Sweetwater Strand. Along the way the cypress swamp fences the road and culverts placed to allow the water to flow north-to-south across the road, create pools at intermittent intervals. Plants and animals become abundant. Great, tall cypress trees, limbs laden with airplants - like ornaments on Christmas trees - gather around these pools forming some of the more spectacular scenery along the drive. Large wading birds can often be seen resting on branches or peering into the shallows, looking for food. Here too, alligators frequently sun on the southern edge of the roadway, feet and inches from car doors and windows. It is not uncommon, after a chilly winter's morning, to find these huge reptiles sprawled across the road sunning themselves, in alligator nirvana, making the trail impassible. Most of the time they will readily yield in advance to an oncoming vehicle and hastily crawl back to the water. Sometimes, though, you'll run across an obstinate creature, who'll challenge your use of the road. We use the "vehicle creep" method to dislodge these big lizards, inching forward as slowly as possible and allowing the noise of the engine compartment to intimidate the gator into retreat. Sometimes they are as little as a few feet from the front bumper before they finally give in, slowly crawling off in a haughty display of defiance. On one trip we stopped initially about 10 feet from our obstacle, an eight-footer across twelve feet of roadway. It moved when we stopped, revealing what must have been a broken left front leg. We wondered if its unfortunate condition had come from a vehicle collision; someone driving too fast and expecting it to move rapidly from the road. It bears repeating: most of the time they do get out of the way well in advance of your arriving vehicle but be prepared to stop for those that don't. It's not wise to get out of the car to prompt them either, as they seldom respond to any of your gestures or verbal threats and this may provoke an attack. You'll recognize Sweetwater Strand easily as the tall patch of cypress straddling the road near the only concrete bridge along the trail. People enjoy this spot as much as the local wildlife do. Beautiful vistas - probably some of the most beautiful in Florida - are to be found here. It's a peaceful, serene spot most of the day. Some vehicular traffic changes that as a few oafs don't feel the need to slow down when crossing the bridge. But this is a special place recognized by many; they'll exit their cars and unconsciously communicate in whispers, as not to disturb the silence of the area. These feelings of solemnity are not unlike those similarly experienced when one enters an empty church: inspiring and awesome. The magnificence of this natural testimonial to God easily overwhelms. His tabernacle; I should not be surprised to find out that He rests and contemplates here, much as I do. While the stillness at Sweetwater Strand can be stunning, the intermittent cacophony of sounds can sometimes be startling. Raucous calls from large wading birds roll down the slough like thunder. Flocks of Ibis, trumpeting their presence, move periodically through the forest, flying sometimes directly overhead, their wing beats heard uncomfortably close. Black vultures roost overnight in the trees here, an early morning surprise to intrepid visitors standing under the overhanging branches. The communal prompting of these large black birds objecting to intrusions sounds so much like a dog - "wuf... wuf..." - that you'll repeatedly look around for Fido. Red-shouldered hawks, sentinels of the forest, scream in the distance. Alligators intermittently lend their bellows to the chorus, sending nervous shivers through all animal life nearby. Frogs, insects and even the wind in the treetops contribute to the primordial sounds that echo through the cypress forest. For optimum wildlife viewing, it is best to avoid the rainy season in South Florida. This generally includes the months of June, July, August and September but can be as early as May and as late as October. During these months water levels in the interior rise, creating new food sources and territories. Land, water and air creatures migrate to these generally remote locations, reducing the amount of wildlife available to see along most of the more popular trails, including Loop Road. Avoiding the Summer means that you'll miss an outstanding opportunity to integrate with some really hostile predators of the Florida swamps - mosquitoes, biting horse flies, gnats and no-see-ums - but that's the breaks! However, horticultural displays are generally the most prominent in late Spring, Summer and early Fall so those wishing to see flora rather than fauna should plan visits then. You will be touring through a remote and wild area of Florida so remember to check your gas and automobile fitness; bring food and water; wear adequate clothing, sun and insect protection. As always, when viewing wildlife, keep a safe distance and resist the urge to feed them. Care should be taken on Loop Road when leaving your vehicle. Snakes and alligators can gather in the pools and canals in large numbers and can be easily overlooked in the dense underbrush. While they will generally retreat when you get too close, it's those you don't see that may pose the greatest danger. Remember also that there can be penalties for feeding and aggravating some wildlife and disturbing or collecting plant life so it's best to observe the motto: "take only pictures; leave only footprints." Brown water snake - this 3' long water moccasin look-a-like bites!